New York, NY, June 5, 2018 - Here in New York, Sea Grant funds a wide-range of research studies, extension activities and education efforts in both the State's Great Lakes and the marine waters - including the Hudson, St. Lawrence and Niagara Rivers, Lakes Ontario, Erie and Champlain, Long Island Sound, inland bays, Jamaica Bay and the Atlantic Ocean. Throughout the country, though, there is an even larger collection of vital work being done by the 33 university-based Sea Grant programs, each of them protecting and preserving America's coastlines and water resources. 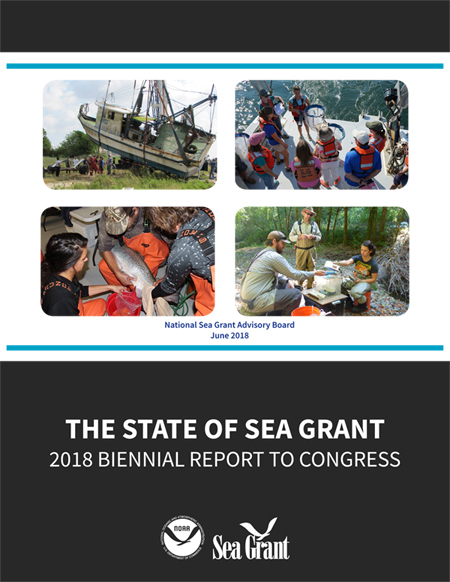 If you're interested in learning more about what each of the respective Sea Grant programs has accomplished towards that goal, check out the latest Sea Grant report, "The State of Sea Grant: 2018 Biennial Report to Congress" (pdf). Submitted to Congress every two years by the National Sea Grant Advisory Board (NSGAB), the report features detailed information about each program's education, research, and outreach achievements, as well as short- and long-term goals for future action. In the last two years, the National Oceanic and Atmospheric Administration (NOAA)'s National Sea Grant College Programs across the country have created or sustained over 7,100 jobs and 1,300 businesses, provided 1,099 training events to coastal communities, and reached some 781,164 K-12 students. Over 500 Sea Grant extension agents and 300 educators are stationed in communities across the country to advance understanding of ocean, coastal and Great Lakes science for increasing resilience of communities and economies. With a federal investment in Sea Grant of $74 million in 2016, the collective efforts of these and other Sea Grant employees and funded investigators has resulted in a $611 million economic benefit. This 20 page report outlines Sea Grant's many successes in a number of key coastal areas of focus, including (1) sustainable fisheries and aquaculture, (2) healthy coastal ecosystems, (3) resilient communities and economies and (4) environmental literacy and workforce development. Congress established the National Sea Grant College Program in 1966 to bring practical scientific information from the nation’s universities to coastal businesses, citizens and all levels of government in order to capture the economic and social benefits of the nation’s oceans, coasts and Great Lakes in a sustainable way. For over 50 years, Sea Grant research, extension, and education have been substantively engaging coastal and Great Lakes communities. These efforts align with Sea Grant’s mission, which is "to enhance the practical use and conservation of coastal, marine, and Great Lakes resources in order to create a sustainable economy and environment." For more in-depth information about the work that Sea Grant does to protect America's waterways, check out the "Sea Grant Programs" drop-down menu at seagrant.noaa.gov. There, you'll find highlights from some of New York Sea Grant's more recent efforts.